I’m a big advocate of taking the subway to lunch. If you have a monthly pass it’s free, and with a little bit of planning you can easily get a delicious lunch in a different neighborhood in under an hour. If you don’t like to plan do what Peter Cherches from Word of Mouth does- play subway roulette. Yesterday, the E came so he ended up at Bali Nusa on 9th Ave. (one of my personal favorite out of bounds lunch spots.) This could be the greatest idea ever. 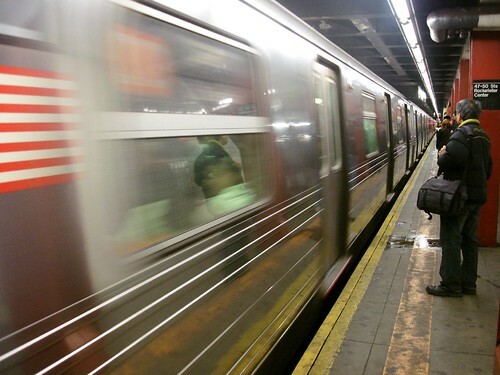 Do you work near a subway stop with multiple trains? What would your roulette options look like? Posted by Zach Brooks at 1:30 pm, May 27th, 2009 under Subway Lunch. I love the idea! I’m going to try it soon. I am on Wall St with the 2/3 available so could go to Brooklyn easily. I had Bali Nusa take out last night! The names of the dishes are so fun to day-tong tong berong? The Perkedel Jagung shrimp corn fritters were super greasy in a delicious way. that’s true, joe r, but that’s a little tougher to gauge as far as the roulette goes…. I’m by Herald Sq I take the train to lunch all the time! Just today I went to Union Sq to get a roll at the Farmers Market to go with the soup I made! Sometimes to W 4th to get Mamouns and recently when I wanted to kill my boss I got Mamouns and then went to a bar. Ha! Take that! I work near the 1,2,3,N,R,Q,W,A,C,E,B,D,F,V lines. the only problem is at lunch hours, trains will run 5-10 min headways, so i could be down there for a total of 20 minutes or more waiting for trains. If I had a two hour lunch, Jackson heights would be doable. would you ride the train for 30 min just to visit the tamale lady at jackson heights? I envy people who get an hour to eat lunch. I’ve done lunch in Chinatown and the LES. Travel time might be an issue if it’s a sit-down meal. It definitely isn’t an issue if it’s a pick up and go type of dealie. I take that exact station too. The options are kinda limited though since we can’t take the train northbound (goes to long island city/queens). i used to hit up happy well being, white castle, or that per lb buffet at rock center. sometimes i’ll take the 6 downtown to the green market. taking the 6 is more of a planned thing than roulette because the connection between that and the E/V trains is a ridiculous 5 minute twistyturny walk.